We are pleased to announce the arrival of intra-oral scanners at Adent Dental Clinic. Comfort, speed & precision. 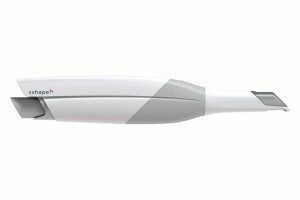 Adent announces the arrival of intra-oral cameras. But what do they actually do? Always at the forefront of technology, Adent is now working with the respected Swiss technology Straumann®. Keen to keep up with technological changes, Adent has bought six top quality, cutting-edge intra-oral scanners for its clinics and a milling machine for the in-house Adent 3D lab. These two machines complement each other and revolutionise the manufacturing process for dentures. The intra-oral scanner takes a digital dental impression. No more old-style silicone impressions of your teeth that leave a bad taste in the mouth! From now on, the scanner takes the form of a camera set in its own handle. The image of your oral cavity is recreated in 3D on the screen. The practitioner sees your oral cavity from every angle and obtains precise information that enables them to best prepare the environment in which the dentures will be placed (crown, onlay, inlay, bridge, veneer). Given the digital precision and an image that shows all aspects of the oral cavity, the camera is a tool that is also used in orthodontics. The 3D image is then sent electronically to the lab. The size, design and colour are developed and selected directly on screen, using a specially designed program. The dental technician can shape the dentures in this way. The last stage in the process of digital creation of dentures involves the milling machine. The data chosen by the technician – size, form and colour – is captured and collected by the milling machine. The machine then starts work and tailors the selected item in the chosen material. Your dentures are finished! If alterations prove necessary after the milling machine stage, these are made manually by the dental technician. The dentist then fixes the dentures in the mouth and makes the finishing touches, such as polishing. What are the advantages of digitalisation? This technology provides comfort because it reduces the production time and avoids the step of taking an impression with silicone gel. Your dentures are ready faster, thanks to the electronic transmission of digital files, and they fit perfectly into their environment, thanks to the high precision technology. A further advantage of this new technology is that it increases the prosthetic possibilities through use of new, more resistant materials. You benefit from the very latest technologies. Find the scanners in our clinics of Aubonne, Ebikon, Ecublens, Genève Eaux-Vives, Meyrin and Yverdon.